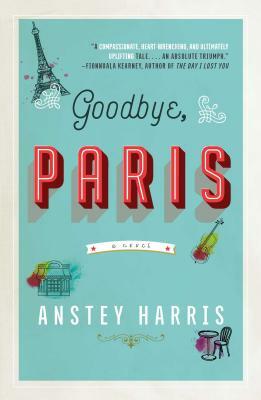 Jojo Moyes meets Eleanor Oliphant in Goodbye, Paris, an utterly charming novel that proves that sometimes you have to break your heart to make it whole. Grace once had the beginnings of a promising musical career, but she hasn’t been able to play her cello publicly since a traumatic event at music college years ago. Since then, she’s built a quiet life for herself in her small English village, repairing instruments and nurturing her long- distance affair with David, the man who has helped her rebuild her life even as she puts her dreams of a family on hold until his children are old enough for him to leave his loveless marriage. But when David saves the life of a woman in the Paris Metro, his resulting fame shines a light onto the real state of the relationship(s) in his life. Shattered, Grace hits rock bottom and abandons everything that has been important to her, including her dream of entering and winning the world’s most important violin-making competition. Her closest friends—a charming elderly violinist with a secret love affair of his own, and her store clerk, a gifted but angst-ridden teenage girl—step in to help, but will their friendship be enough to help her pick up the pieces? Filled with lovable, quirky characters, this poignant novel explores the realities of relationships and heartbreak and shows that when it comes to love, there’s more than one way to find happiness. Anstey Harris teaches creative writing for Canterbury Christ Church University and in the community with her own company, Writing Matters. Harris’s short stories have been widely published in anthologies and online and she was the winner of the H.G. Wells Short Story Prize in 2015. She was recently shortlisted in the National Gallery Short Story Competition and chosen by The Word Factory to read her short story, “A Hairy Tale”, alongside A.L. Kennedy at their June literary salon in 2016. She is a three-time winner of the Faber Academy’s #QuickFic competition. Anstey lives in Kent, England, and is the mother of the singer-songwriter (famous for her stint on The X-Factor) Lucy Spraggan. "As elegant and uplifting as a classical sonata, with added kick from its unforgettably quirky characters. I was both engrossed in and moved by this fabulous debut."